We have got a fantastic recipe this week! I used to love Hot Pockets growing up and have been looking for a way to get that tasty goodness into my new Ketogenic diet world. I think we’ve conquered it with this new recipe for Ketogenic Pizza Hot Pockets! 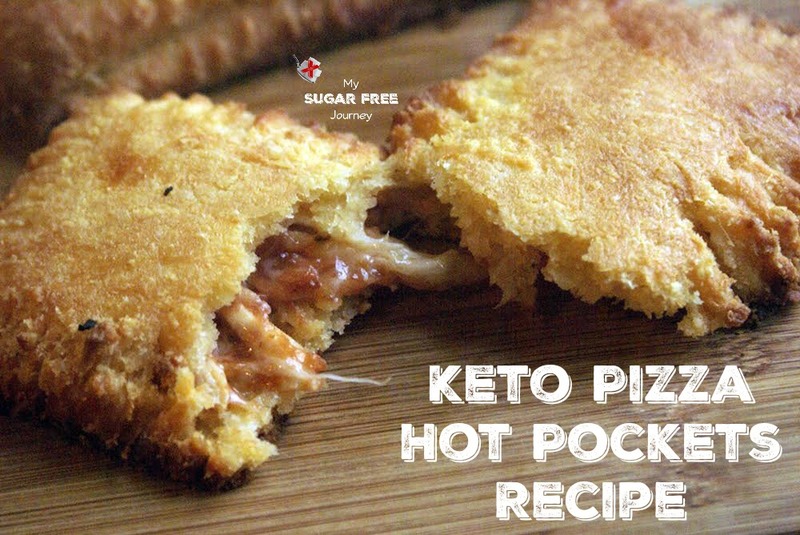 An awesome way to fit Hot Pockets into your Ketogenic world! 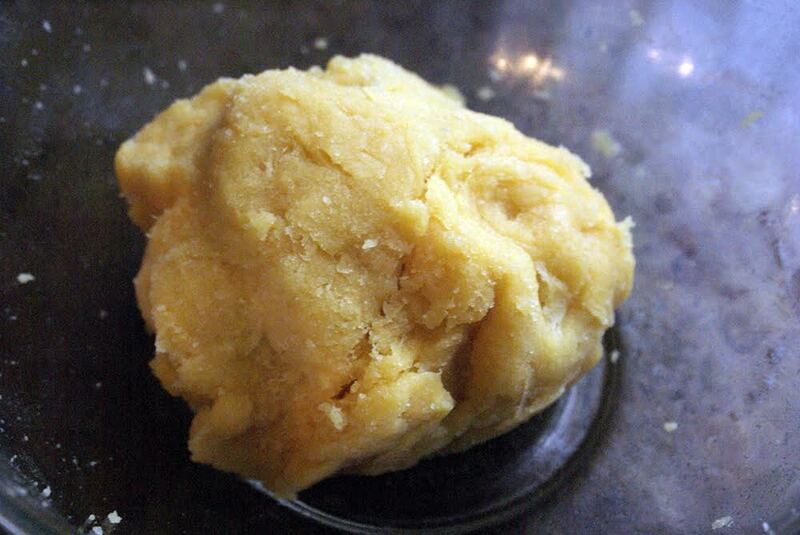 in a medium sized bowl, add almond flour, coconut flour, baking powder, and salt. In a pan over a low heat, add butter until melted. Then add 2 cups of cheddar jack cheese. Continue stirring cheese until melted and becomes smooth. Add cheese "batter" into bowl you set aside with your dry ingredients. Add egg and mix well until you get a nice dough ball formed. 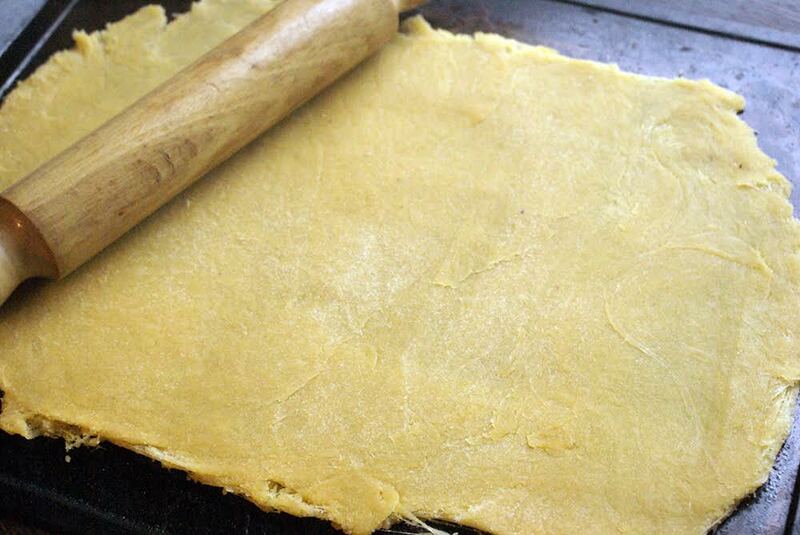 On a dry surface and with a rolling pin, create a 9" x 13" rectangular shape. With a paring knife, cut out 10 equal rectangles. You will need 5 for the bottom and 5 for the top. 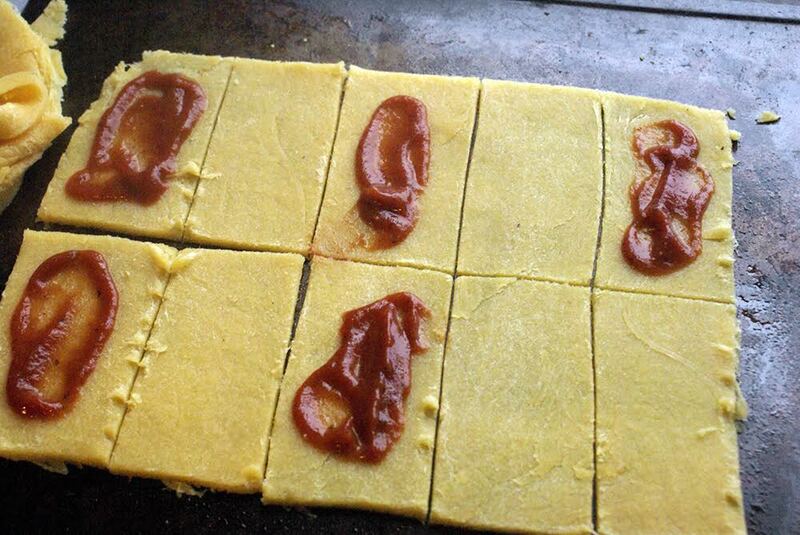 To your base rectangles, add: a ½ teaspoon of sauce, shredded chicken, and then mozzarella cheese. Your dough will be sturdy, so don't afraid to use it! Place the tops on all of your base rectangles, then crimp the edges together with a fork. 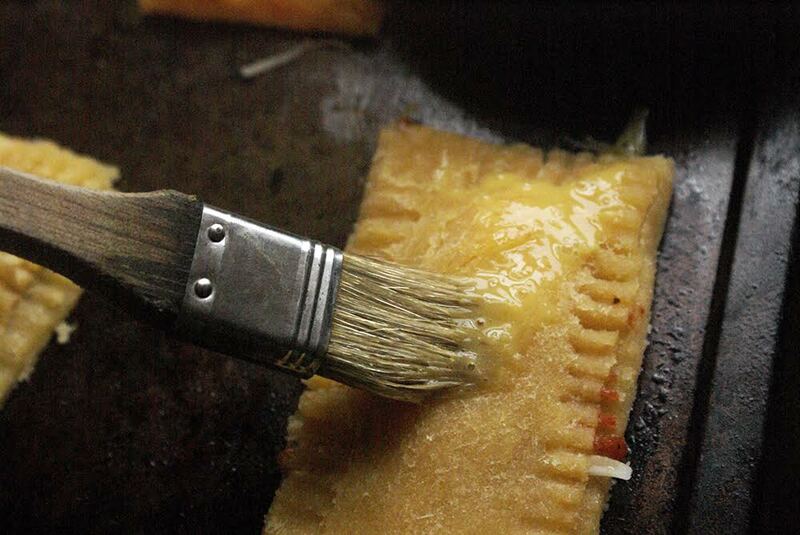 With a pastry brush, brush a light coat of your beaten egg on top. Bake for approximately 16-18 minutes, or until a beautiful golden brown color. Allow to cool for 5 minutes then serve! Before we get into the recipe, there are a few things you need to know about the sauce because that is where you will often find hidden sugars sneak into your recipe. My current favorite is the DelGrosso line of sauces and can tell you that the Marinara is incredible and has no added sugar. I have also heard good things about Scarpetta which can be ordered direct from Amazon but haven’t tried it myself. Of course you can make your own with this Sugar Free Red Pasta Sauce Recipe, just leave out the hamburger meat and dice the veggies super fine. Also, keep in mind that while these are filled with chicken, you can make them with anything. 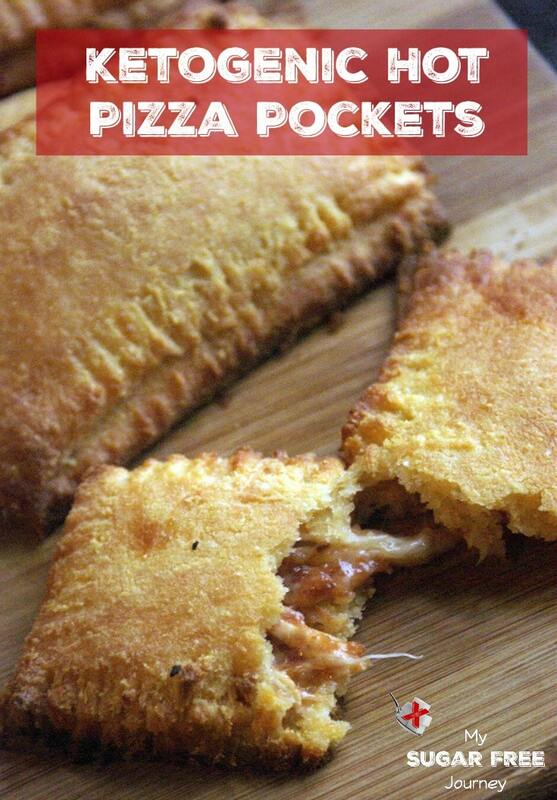 Want a different pizza pocket? Use Pepperoni and a Mozzarella/Cheddar blend. You want something a little more like a Philly cheese steak? Throw some shaved beef with peppers, onions and provolone in there. In other words, go nuts. The possibilities are endless. 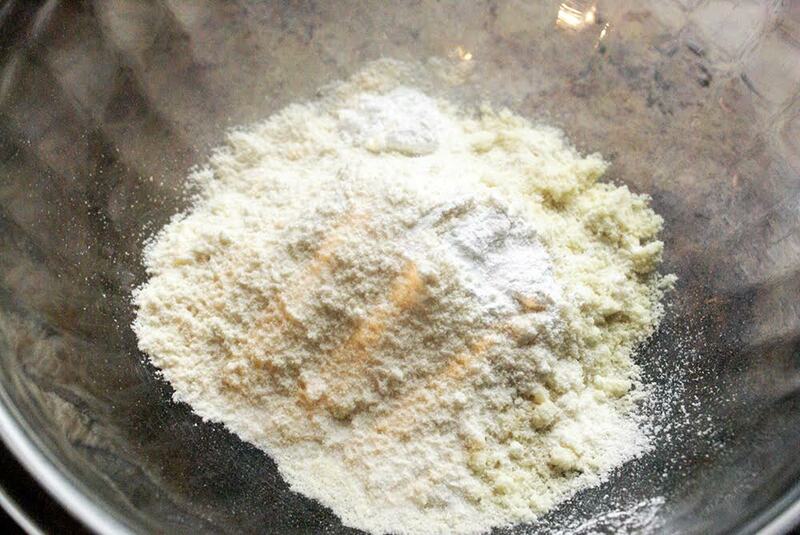 Add cheese “batter” into bowl you set aside with your dry ingredients. On a dry surface and with a rolling pin, create a 9″ x 13″ rectangular shape. 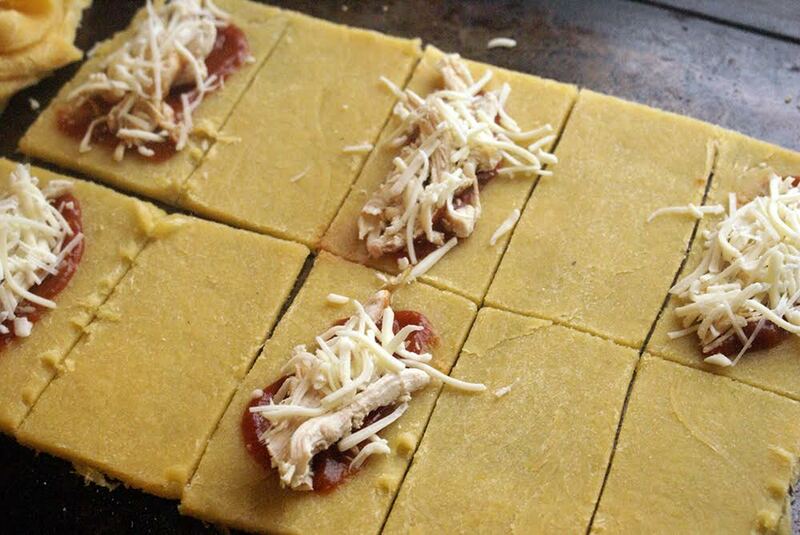 To your base rectangles, add: a 1/2 teaspoon of sauce, shredded chicken, and then mozzarella cheese. Your dough will be sturdy, so don’t afraid to use it! What kind of Ketogenic Diet hot pocket recipe are you going to make? NEXT POST Next post: 2/16 Weightloss Wednesday: My Insulin Resistance Has Diminished! Great recipe. Thanks for the share. What knife you used to slice them?